Data management for mobile applications is exactly what it sounds like: it’s all about moving data around. It isn’t an application design problem, yet so many people approach it at the API layer. 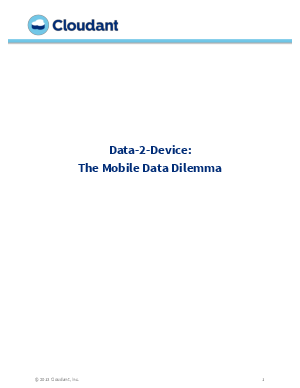 Great mobile apps should work well both on- and offline, and require a new way of thinking about data modeling for easy portability across devices — telecom and otherwise. Many approaches to synchronizing mobile app data use API abstractions and caching mechanisms, but at Cloudant we see an opportunity to simplify this equation by moving data closer to the network edge. This calls for a distributed database on a massive scale. Cloudant’s distributed database-as-a-service (DBaaS) was designed in this mold, built on the Apache CouchDB and adding a powerful horizontal scaling and fault tolerance framework, built-in full-text search based on Apache Lucene, an incremental MapReduce engine, and design expertise and 24/7 monitoring for customers.